Cocktail. If you haven't seen the movie, it's definitely worth watching. 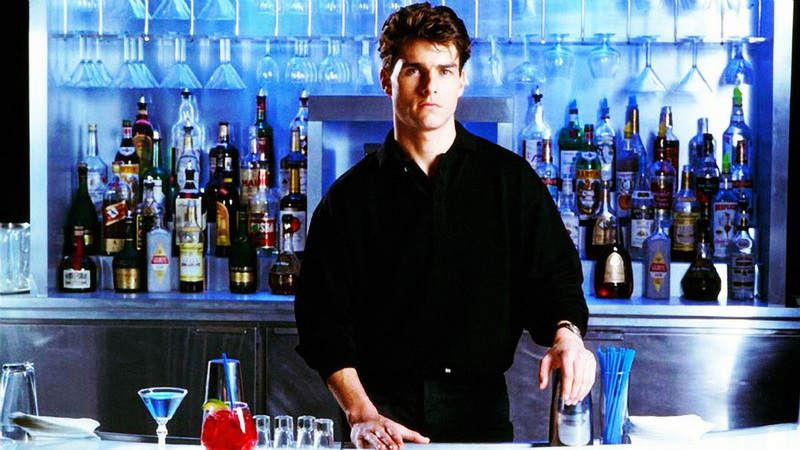 A young Tom Cruise stars as bartender who has big dreams of having his own bar and being the best bartender in New York City. He's flashy, charismatic, and most importantly, good at what he does. Guys who watch this movie will dream of being this guy. And there are guys who go as far as TRYING to be this guy. Unfortunately, at an event earlier this week, the bartender trying desperately to be Tom Cruise couldn't measure up. In a crowded bar, while he was trying so hard to be cool, he was moving slowly, ignoring half of the bar, fumbling around, and breaking bottles and glasses along the way. He was booed tremendously. And he deserved it – he was awful. No matter how cool you look, if you're not good at what you do, it doesn't matter. I'd rather have ZERO flare and a perfectly made drink than all the flash and a crappy drink. It's very similar to when I take clients to the bar. Many will try to throw the excuse, "there's no way I'll do well at a bar because I'm an introvert." So for all the introverts out there, read carefully. You may have to introduce yourself to the group as a whole but you don't have to try to keep everyone's attention. Don't be that guy. Stick to what you're good at.